Up fairly early, we got coffee and bagels at the hotel. 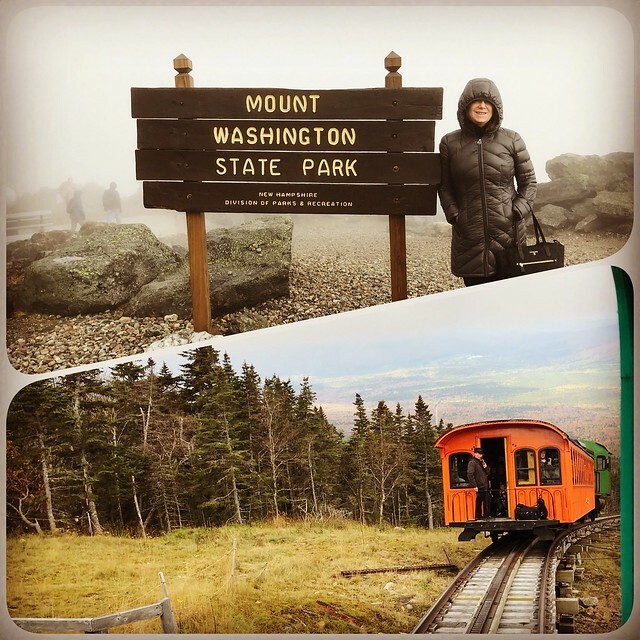 The plan for the day was to take the 9:30 am cog train to the top of Mount Washington. When I went to get coffee, I noticed that the top of the mountain was shrouded by clouds. It didn't get any better over the course of the day. Yesterday when we got to hotel, the top of the mountain was clear! We got to the Mount Washington Cog Railway just before 9:00 am. The visibility got increasing bad as we went up the mountain. At the top, you could see about 50 yards and the wind was about 30 miles an hours. We spent a little over an hour at the top, including touring the museum. Although the museum was not worth the price of admission ($2), I was amazed by the stuffed fox. As we went down the mountain, the visibility cleared up. We got some great views. We headed back to the hotel for lunch. We had a great table outside at Stickney's. Sharon had a chopped salad, while I had a melted salmon sandwich. After lunch, we headed to Crawford Notch State Park for a hike. 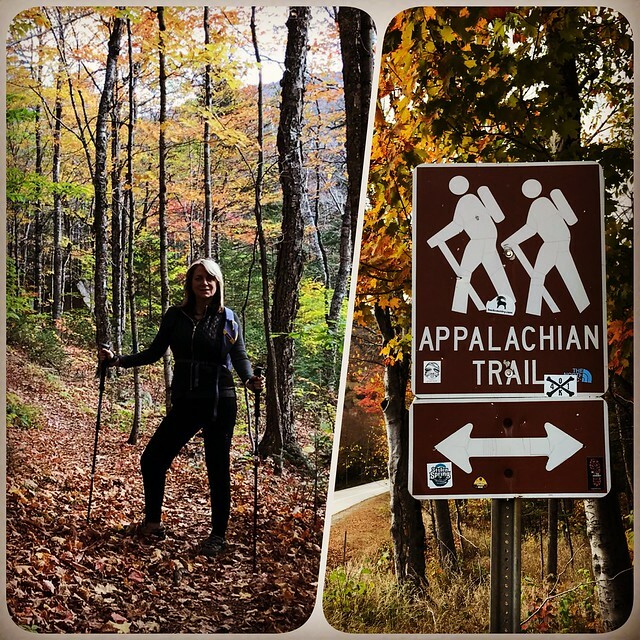 We hiked the Sam Wiley trail to the Appalachian Trail. We then hiked back along the Westside Trail. This turned out to be a little bit of a mistake. While the trail was well marked, it was not well traveled or maintained. It was very slow going. We ended up hiking just under 3 miles in two hours. Back at the car, we drove about 15 miles further up the road before heading back to the hotel. While we were told that the peak of the foliage was a week ago, the scenery was still amazing. We finished the night with a late dinner at the Bretton Arms dining room. This was the best dinner we had on the trip so far. After splitting a Tempura Artichoke (Crispy Prosciutto, Charred Baby Bell Peppers, Vermont Goat Cheese Pesto), I had Misty Knoll Statler Chicken Breast (Guajillo Chili Roasted Chicken, Grilled Corn, Chorizo, Sweet Onions, Queso Fresco Grits, Chicken Jus), while Sharon had Herb Roasted Rack of Colorado Grass Fed Lamb (Crispy Potato Au Gratin, Roasted Brussel Sprouts, Green Apple, Black Fig Demi Glace). For dessert, we had Maple Creme Brûlée. The chicken was very good; I never order chicken in a restaurant! We went with their suggested wine pairing, including: Erath, Pinot Gris, Oregon with the starter; Jelly Jar, Old Vine Zinfandel, Nova Vineyard, Lake County, California with my entree; Mollydooker, The Boxer, Shiraz, Australia; and, Eden, Ice Cider, Heirloom Blend, Vermont with dessert.